Swansea University’s School of Engineering, have some of the brightest brains in Britain, and their work on finding a replacement for the incandescent bulb to reduce energy use is proving just that. Lighting accounts for around 30% of electricity usage in the UK alone. It’s also is a major contributor to CO2 emissions; equivalent to 70% of that from the world’s cars. The introduction of ultra-efficient lamp and control technologies could half the energy consumption used for lighting. Currently most lighting found within homes, hospitals and offices is either incandescent, fluorescent or halogen. Incandescent lighting technology is now the best it can be. It produces light of high quality, but is not energy efficient. Compact fluorescent light bulbs (CFL) have good energy efficiencies but have a noticeable warm up period before they achieve maximum brightness, and there has been a recent concern about the UV emissions given from them, as well as over their waste disposal due to their mercury content. In response to these findings, a team of engineers at Swansea University began work on a Collaborative Industrial Research Project (CIRP) in January 2009, called Incandescent Replacement using Light Emitting Diodes (IRuLEDs), alongside companies Enfis Ltd and RUMM Ltd. The aim of the project was to develop an LED light bulb comparable to the 60W incandescent light source. 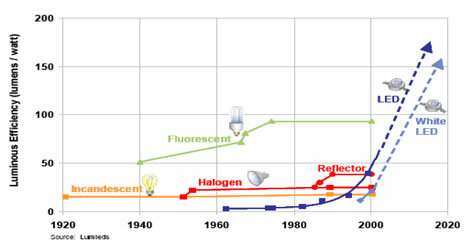 Figure 1: Showing the developments and expectations of various lighting technologies. “After some trial and error, research and development, we produced a prototype lamp that included an AC-DC power conversion. We also added a dome coated with a phosphor, courtesy of Brunel University, to the LED. Following this huge achievement, and a number of other successful collaborative research projects, in March 2009 the team established the Welsh Ultra-Efficient Lighting Centre (WUELC) with the Welsh School of Architecture, Cardiff University and Enfis Group plc; the first centre of its kind in the UK. WUELC promotes the use of ultra-efficient light sources and lighting control technologies to minimize energy consumption in the private and public sectors, and reduce carbon emissions. The hard work of the WUELC team, and the importance of this research and development to low carbon initiatives meant that in October 2009 a Welsh Assembly Government Academic Expertise for Business (A4B) funding award was approved for WUELC to become a Knowledge Transfer Centre (KTC). “Becoming a KTC, and receiving the funding to share our new technology with others was excellent for the project. If the team’s success is to be measured by anything, then it should be noted that they are working with several accrediting bodies for standards in the lighting industry, including the CIE (the International Commission for Illumination) who set the standards for light measurements as well as the National Physical Laboratory, a world leading centre of excellence in developing and applying accurate measurement standards, and are also one of only five centres registered with the Government for independent light measurements.